Most motorists take their exhaust system fitted to their car for granted – its hardly visible, doesn’t have any moving parts and dent require maintenance other than inspection. But the exhaust is a vital, complex and scientifically designed system, designed to do much more than simply quieten the sound coming from the power unit; an efficient exhaust system improves power output, decreases fuel consumption, protects the environment and minimises engine noise. Often motorists are unaware of their exhaust system until it fails – either a hole has developed in a silencer box or a mount fails and part of the system drags along the road. Every engine has a specially designed, tailor made exhaust system specially created to maximise the engines power through efficient managements of exhaust gases. The red hot gasses are directed from the exhaust ducts on the engines cylinder head, through the manifold and down into the exhaust pipe. There the gasses pass through a series of silencer boxes where vertical plates called baffles (perforated tubes and basalt wool) control the gases and reduce the noise before expelling the gas through the tail pipe. With car manufacturers and exhaust system designers becoming increasingly concerned about environmental issues, new components are becoming increasingly common in the exhaust system – catalytic converters and diesel particulate filters. 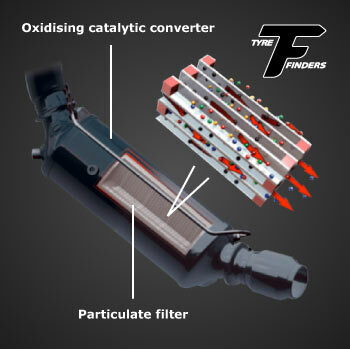 These components known as a ‘CAT’s’ and DPF’s respectively, are designed to drastically reduce the environmentally hazardous content of the exhaust gasses. Using a ceramic- based filter, the noxious elements are converted by the CAT, into relatively harmless gasses before passing their way through the system. A diesel particulate filter is a device designed to remove diesel particulate matter or soot from the exhaust gas of a diesel engine. Wall-flow diesel particulate filters usually remove 85% or more of the soot, and can at times (heavily loaded condition) attain soot removal efficiencies of close to 100%. A diesel-powered vehicle equipped with a functioning filter will emit no visible smoke from its exhaust pipe. When an internal combustion engine starts, especially from cold, significant amounts of water and corrosive materials are produced as a by-product of combustion. You will often see drops of water dripping from the exhaust pipe of a car that has just been started from cold. Unfortunately, these corrosive elements gather in the silencer boxes and attack the metal from the inside, so a silencer might look in reasonable condition from the outside but could be perilously close to failing. 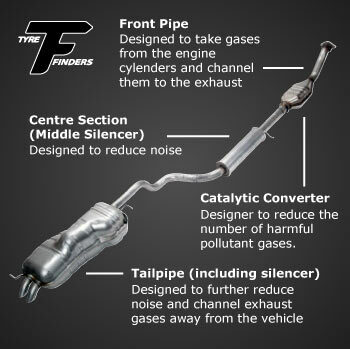 TyreFinders will gladly inspect your exhaust system free of change.